This Czech-style pilsner from St. Louis’ 2nd Shift Brewing is named for a Black Sabbath album, but Technical Ecstasy also describes the feeling I get drinking this beer. Czech pilsners are a difficult beer style to brew, and when a brewery—especially an American one— nails it, it’s cause for celebration. My colleague Andrew Gill has already explained the history behind pilsners, for those who’d like to learn more about their origins. And as he says, pilsners don’t leave much room for hiding flaws, so these can be a difficult style for brewers to replicate. 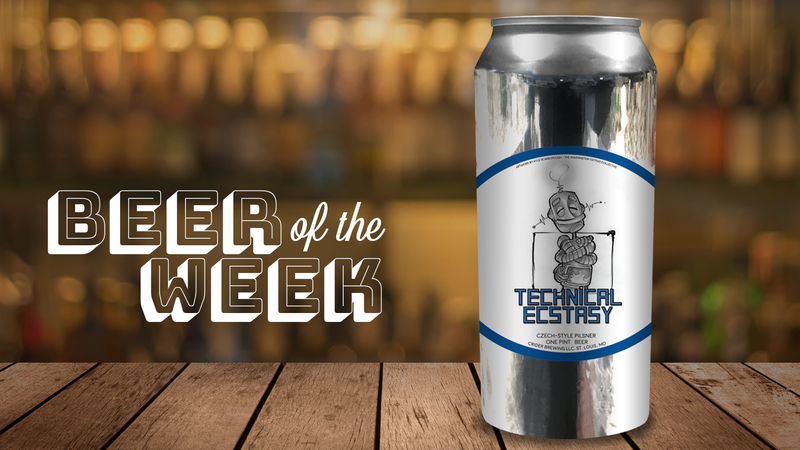 Technical Ecstasy is a commendable, American-made homage to its Plzeň-brewed forefathers, starting with its appealing straw color and delicate, moussey head. Saaz hops’ signature spicy-earthy aroma leaps from the glass; I often perceive their earthiness as a cedar wood scent. Beneath that is that dignified, slightly sweet pilsner malt aroma, contributing to an overall clean, refined impression before you even take a sip. To be true to their origins, European-style lagers require fairly specific ingredients, and I can tell 2nd Shift’s brewers have been faithful. In the case of a Czech lager, Saaz hops are a must. 2nd Shift uses not just Saaz hops but also Bohemian malt, another important component of the style. If you want to get granular, even water chemistry matters when brewing a Czech pilsner, because soft water with low ion and carbonate content helps create the “rounded” hop profile that defines these beers. On the tongue, this beer’s pilsner malt sweetness leads the way. It’s a tough flavor to pin down, but think clover-honey-meets-grain. Then Saaz hops sweep in, imparting black pepper spice plus dried oregano and thyme flavors. The beer’s lively carbonation eventually whisks away the sip, but the fine bubbles don’t rush the prolonged, balanced finish. That’s a good thing, because I wanted to savor this elegant sip, which is leagues away from the American stereotype of pilsner as fizzy, tasteless water. This beer is on the light side of the spectrum, to be sure, but with so much character. Pilsner Urquell is the prototypical Czech pilsner—though any beer expert worth their salt will tell you it tastes even better on draft in the Czech Republic. That shouldn’t keep American drinkers from seeking out this style, though. At their best, Czech pilsners are the ballerinas of the beer world: a lot of technique finessed into a delicate, light package. 2nd Shift distributes around St. Louis, Chicago, and Nashville.